Galaxy Digital is a mobile-friendly volunteer management software. It offers four products: Get Connected (for volunteer centers), Campus Connect (for colleges and universities), Corporate Connect (for businesses), and Community Connect (for nonprofits). Get Connected is designed to help organizations of all types to manage, track, and grow their volunteer programs. It is an easy to use, volunteer opportunity database and community engagement app that makes it easy to recruit, manage, track, and retain volunteers. This product is used by thousands of corporations, campuses, volunteer centers, United Ways, and nonprofit agencies across the U.S.
You can contact the vendor and request a demo to learn more about the product you are interested in and understand if it suits your needs. 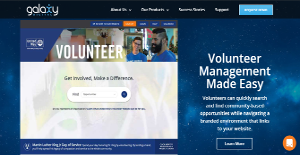 The Galaxy knowledge center offers volunteer management best practices, recent product updates, and the latest news about the products and their features and benefits. Plus, you can make use of best-in-breed integrations with leading solutions to save time and boost your impact. Mobile-friendly volunteer management software designed to develop long-term relationships, increase engagement, and track involvement. United Ways and volunteer centers use Get Connected to attract, manage, and report on volunteer activity in hundreds of communities around the U.S.
Get Connected helps nonprofits to facilitate involvement with other nonprofit agencies, volunteers, corporate partners, and other community groups and affect real change at the local level. A web-based, mobile-friendly solution that can help your campus to pair students, faculty, and staff with local service opportunities. When bundled with the Service Learning Module, Campus Connect makes it easy for school admins to create, manage, track impact, and report on student service learning programs and courses. Web‐based, mobile‐friendly software that will enable your corporation to grow and manage company volunteerism, achieve higher levels of community engagement, and track and share impact. Eliminates the need for the company volunteer coordinators to find and share qualified volunteer opportunities with employees. Delivers simple tools for promoting the company’s favorite community causes and nonprofits within the company. Allows the company to easily generate and share accurate, graphical reporting on corporate engagement and local impact. A highly visual public-facing dashboard enables your company to communicate impact and promote chosen causes and nonprofits. Corporate Connect’s messaging and reporting helps express the company’s commitment to service in the local community. Company employees who are engaged in local service reflect positively on the corporate image. Increase levels of employee productivity and satisfaction in the workplace. Aid significantly in attracting new talent to your workforce. Affordable, mobile-friendly volunteer management software for nonprofit organizations of all sizes. It is a tool for managing, promoting, engaging and reporting your organization’s volunteerism and community impact. An ideal tool for engaging stakeholders, connecting the right people with the right opportunities, promoting your causes, and elevating your brand in the community. Easily add and promote volunteer events and opportunities, schedule and manage volunteers in shifts, use the product’s intuitive and mobile-friendly check-in tool, and manage ongoing volunteer communication. Community Connect learns a volunteer’s passions and interests and provides ongoing recommendations of ideal service opportunities. Track volunteer engagement in real-time and generate live infographic style impact reporting that can be edited and easily shared on your website, via email, or across social media channels. If you are considering Galaxy Digital it might also be a good idea to analyze other subcategories of Best Donor Management Software listed in our database of B2B software reviews. Every company has its own characteristics, and can call for a special Donor Management Software solution that will be adjusted to their company size, type of customers and employees and even individual industry they deal with. We advise you don't count on locating a perfect services that will be suitable for each company regardless of their history is. It may be a good idea to read a few Galaxy Digital reviews first and even then you should remember what the solution is supposed to do for your business and your workers. Do you need an easy and intuitive service with only elementary features? Will you actually make use of the complex functionalities required by experts and big enterprises? Are there any specific features that are especially useful for the industry you work in? If you ask yourself these questions it will be much easier to locate a trustworthy software that will fit your budget. How Much Does Galaxy Digital Cost? We realize that when you make a decision to buy Donor Management Software it’s important not only to see how experts evaluate it in their reviews, but also to find out if the real people and companies that buy it are actually satisfied with the product. That’s why we’ve created our behavior-based Customer Satisfaction Algorithm™ that gathers customer reviews, comments and Galaxy Digital reviews across a wide range of social media sites. The data is then presented in an easy to digest form showing how many people had positive and negative experience with Galaxy Digital. With that information at hand you should be equipped to make an informed buying decision that you won’t regret. What are Galaxy Digital pricing details? What integrations are available for Galaxy Digital? If you need more information about Galaxy Digital or you simply have a question let us know what you need and we’ll forward your request directly to the vendor.